feeling the 'magic' for neon & day glow with hero arts! Home / Inspiration / feeling the 'magic' for neon & day glow with hero arts! Today I am super excited because I have teamed up with Hero Arts to play around with both of our SUPER BRIGHT NEON products! When I saw the new NEON ink pads that Hero Arts was making, i couldn’t wait to get my hands on them! Hero Arts is featuring my Day Glow and Color Magic mixed with their Neon Inks on their blog today, and I invited Melissa Stinson to join me on this little product swap as well! 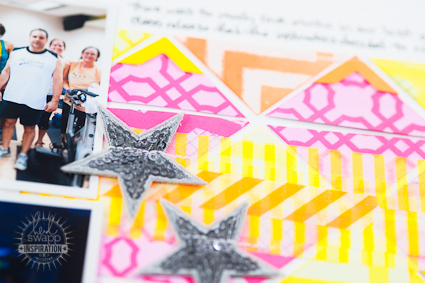 I LOVE what Melissa made… and I LOVED what she taught me about using BRIGHT colors! 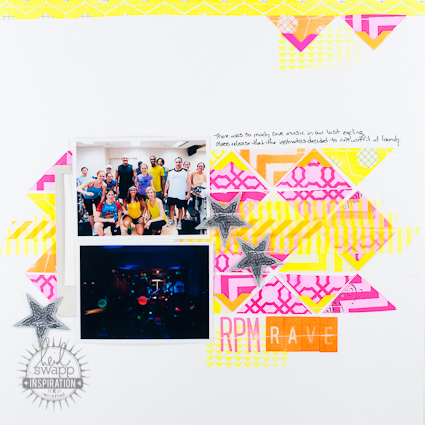 Melissa used the Hero Arts Inks and my Color Magic paper and created a very HIGH IMPACT layout. 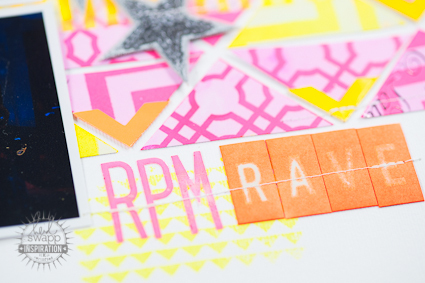 These Neon ink pads SO totally rock! Since neon is such an 80’s throwback anyway, I decided to totally get my retro on and use triangles (evoking memories of Saved By the Bell, anyone?) to create my page background. I cut triangles (each of these is a simple half-square) out of several different patterns of Heidi’s Color Magic papers, then inked each of them up by rubbing it directly over the surface of the ink pad. Hero Arts’ neon inks are super-saturated and give great coverage. Just a hint- the color may look a bit “muddy” when wet after it’s first applied, but as it dries it turns into a true, bright neon color. If you’re mixing several neon shades, keep in mind the “gallon, pint, quart” rule. You don’t have to follow those proportions exactly, but it helps to have one color be more dominant, another in smaller portions, and a final one used as an accent. On my layout I let neon pink be the dominant shade, used yellow more sparingly, and then use just small bits of the orange here and there. Be sure to allow some “breathing room” around all that color! I chose a plain white cardstock background for my page (though you can really use any neutral), because any other non-neutral color would have competed with the neon…and quite honestly would have probably been a bit much! even if NEON is not YOUR THING, how FUN is it that when you are using COLOR MAGIC, you get to use YOUR favorite colors!?! You get to make it yours! That’s the magic… one minute you’re bringing back the 80’s and the next minute you are creating the soft shabby look of Rachael Ashwell! There is nothing more flexible… more full of possibilities than Color Magic! In the spirit of ‘sneak peek’ week… I want to quickly share with you the NEW components of the Color Magic line that will be shipping out Sept 1. To build on the Color Magic collection from January, I created another set of Memory Files…all brand new designs! I took some of my previous designs, and shrunk them down, and created some little notes/tags (I can’t get enough of these!) and also added this totally FABULOUS Marquee style chipboard letters. They are the cutest! SO, whether you are adding the SUPER POP of a Hero ARTs Neon Ink pad… or using markers, mists, paints, or ANY OTHER type or color… you will be feeling the magic!